A currick on Five Pikes - perhaps one of the five pikes? When I first purchased a few sets of Memory Map’s mapping software 7-8 years ago I used to spend quite a bit of my spare time happily planning out future walking routes in the Dales, Lake District and North Pennines. In the intervening years I’ve done almost all these routes but for some reason I’d never done this particular one. The walk connects a number of moorland tops, including two with trig points, together with an extended walk up the valley of Great Eggleshope. With the exception of Islington Hill, which appears on the fairly new list of ‘Fours’, one of the reasons it has perhaps taken me so long to get round to doing this walk is because none of the moorland tops quite qualify for any of the main hill lists I’ve been concentrating on over the last few years. Long Man, for example, falls three metres short of qualifying as a Dewey. Retracing my steps to the grassy track I then continued to follow it south until it turned west to descend to the road. At this point I left the track to trace a smattering of boulders to eventually reach a prominent gritstone edge called Wheel Crag. This airy perch provided a great spot to enjoy the views of the remote Middle End Farm backed by Monk’s Moor and of the moors surround Little Eggles Hope to the north. This was a lovely section of the walk and the easiest underfoot. The broad track led me deeper into the valley leading eventually, after fording the beck, to spoil heaps and some old mine workings. Just past a couple of old mine buildings, where the track re-crosses the beck at a bridge I decided to stop for some lunch. I was just contemplating how quiet and peaceful it was when a steady stream of walkers appeared, walking towards me down the valley before taking the path opposite up Wire Gill. It turned out that they were all doing the 30-mile Durham Dales Challenge and I’d probably picked the one day of the year that I would have seen someone else up there. After finishing my lunch I continued on up the valley and after passing the path climbing over into Hudes Hope I didn’t see anymore of the Durham Dales walkers and all was quiet again. My aim was to walk up the valley as far as the waterfall marked on the map as Black Force. 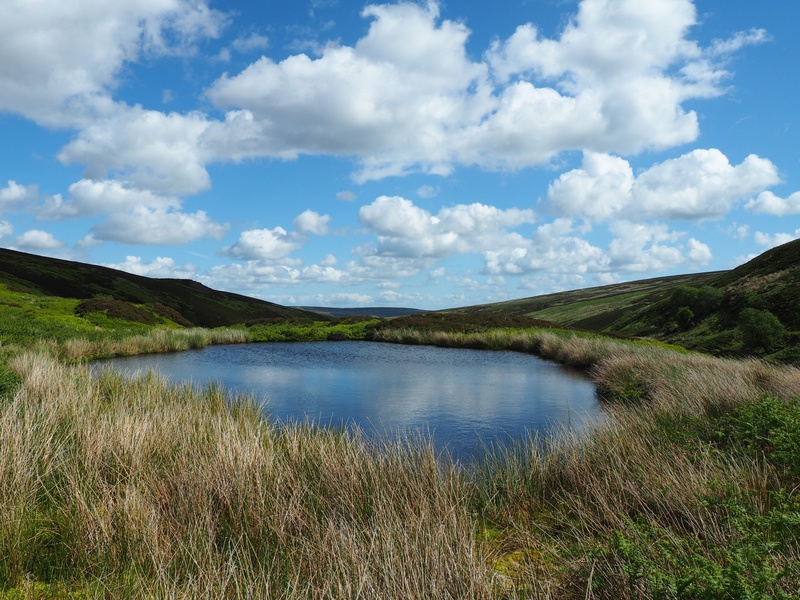 The waterfall proved to be something of a disappointment but ample compensation was had by discovering a lovely little, reed-fringed, tarn just above the beck. From Black Force I next had to negotiate pathless slopes of bracken, heather and moorland grass. Eventually, and somewhat wearily, I arrived at the fence running along the top of Harnisha Hill and which also marks the Tees – Wear watershed. A short way along the fence I came to the stone built trig point on Harnisha Hill, or Raven Seat as it is called on the OS trig database. The views, which very much favoured Weardale to the north, were excellent with the northern Dales tops in view along with the Cleveland Hills south of industrial Teeside. From the trig point it was a simple walk east following the fence down to the summit of the B6278, across the road, and then up to the currick and boundary stone on Long Man. Although a nice spot it wasn’t the summit so I once again tramped about until I was satisfied I must have stood on the highest point and then continued on my way east heading for my next objective, Five Pikes. After dropping down from Jack Scars End I picked up a track near the moorland hump of Pawlaw Pike, this led me nicely to just below the top of Five Pikes and an easy enough clamber through the heather to my second trig point of the day. Once again the views were extensive with a wide sweep of Weardale’s moors to the north and west of me. Meanwhile, to the south-east, the extensive plantations of Hamsterley Forest were dominant. To the north-west, north and south-east of the trig point there were three curricks all of which I visited. Perhaps there was once another currick situated where the trig now stands today, if so that would be four pikes, I wonder what has happened to the fifth? From Five Pikes I returned to the track which led me all the way back to the B6278 just north of the parking area. Though rough and quite hard going in places I thoroughly enjoyed this walk, particularly the section along Great Eggles Hope and the views of Weardale later on in the walk. It is certainly an area I’d return to again but maybe next time, having already visited the trig points and Black Force I’d be tempted by a shorter, easier alternative, making use of the paths in Wire Gill and Little Eggles Hope to create a nice little circular walk.